I finished! Last night I worked long and hard and got it done. I wrapped the backing around the the front for the binding and I probably won’t ever do that again. It was pretty fiddly…partly I think also because it was all flannel and the flannel doesn’t seem to glide through the sewing machine very well (even the walking foot). Oh well, it’s done and it’s bright and beautiful! I am a little concerned though that my sister-in-law will think it is too boyish. My niece is one of those girl babies who has been blessed with a ridiculous amount of pink clothing and playthings; to the point where it almost makes me sick. I’ve never really been much of a fan of gender specific clothing/toys, choosing neutral things for my own son most of the time (to the point where for a long time he didn’t really understand the concept and would run to colorful purple pants in the little girls section of the store saying that he wanted those). In fact I am rather proud of this. My parents were the same way, choosing to decorate mine and my sisters room in primary colors when we were little until we were old enough to choose on our own. I guess it’s just how I was raised. So…of course Aunt Carly had to do a little to push Alllie away from the pink and make the brightest most neutral quilt possible! I confess though I did succumb to a cute little pink truck with Little People and blocks for her for Christmas as well…hey at least it’s a truck! Am I the only one crazy enough to still be making Christmas presents?!? I’ve been wanting to make a nice bright flannel quilt for my 1 year old niece. I found these cool prepackaged sets of 2 coordinating 1 yard pieces of flannel at Tuesday Morning. I cut them into 5″ x 42″ strips (getting 5 from each). 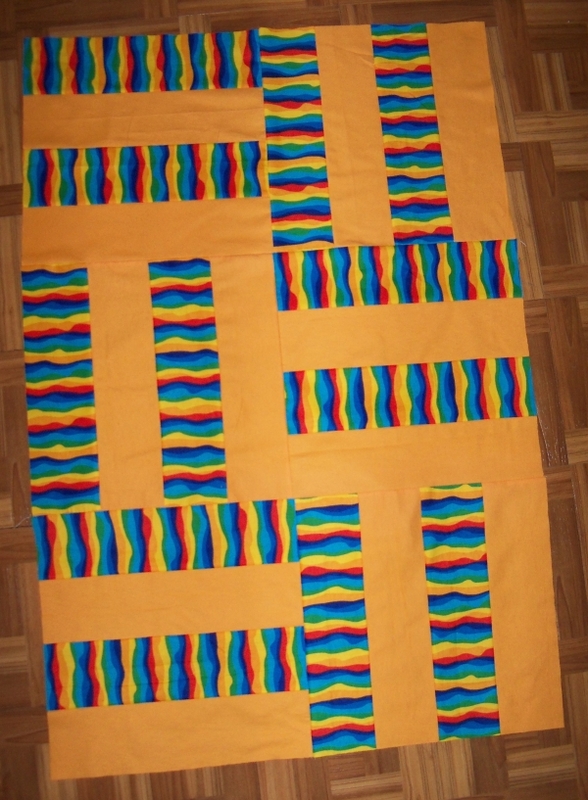 I sewed them together in sets of 4 strips and then cut into 17.75″ blocks. I finished the top last night and am fairly pleased. I also have one block left that I can use to make her doll a mini quilt! Tonight it’s quilt sandwich time! I also got a coordinating 2 yard piece of teal flannel for the backing. So it will be super cozy! Saori weaving as best I can describe it is free-spirited – no rules, just go with the flow. 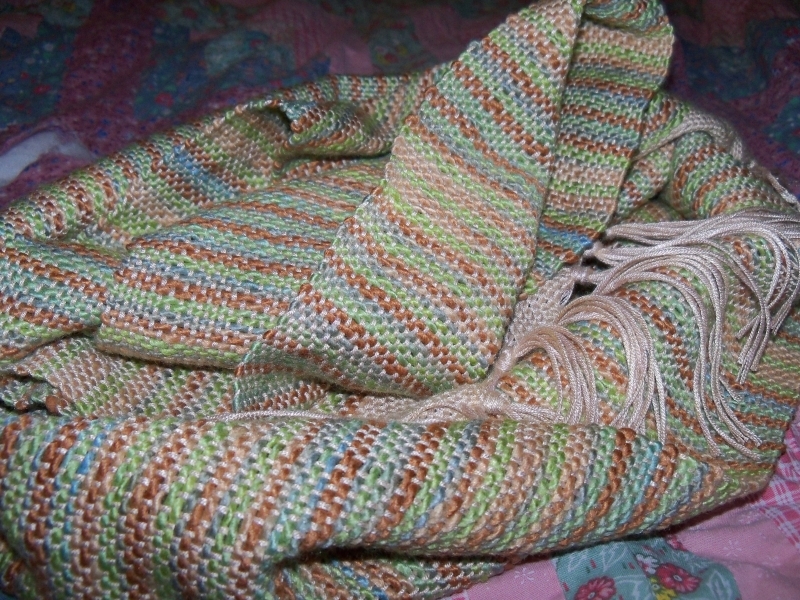 I am a part of a wonderful group on Ravelry called Weaving in the Saori Way that is a source of great inspiration. 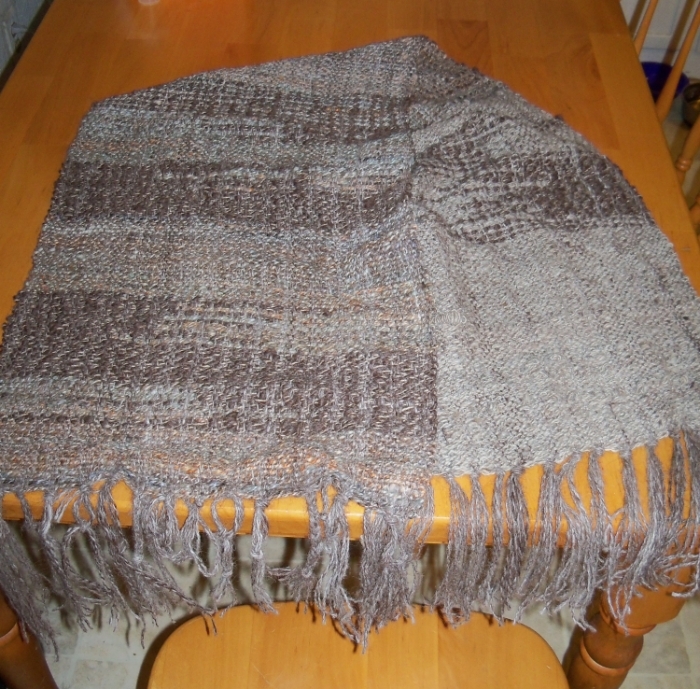 Today I give you my first handspun weaving attempt done saori style. 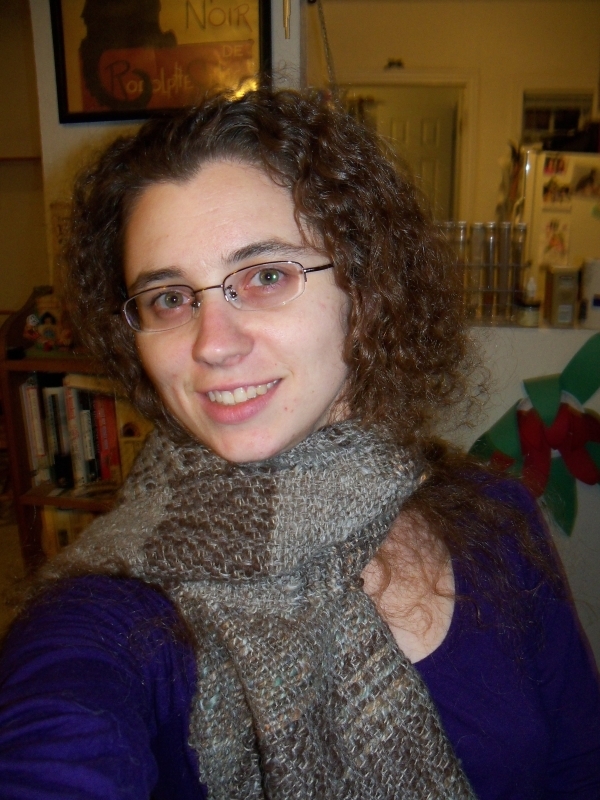 It makes an ok-ish scarf folded lengthwise, but it’s really too wide and short for anything, so I’m not sure what I’ll do with it. I’ll leave you with these thoughts today. 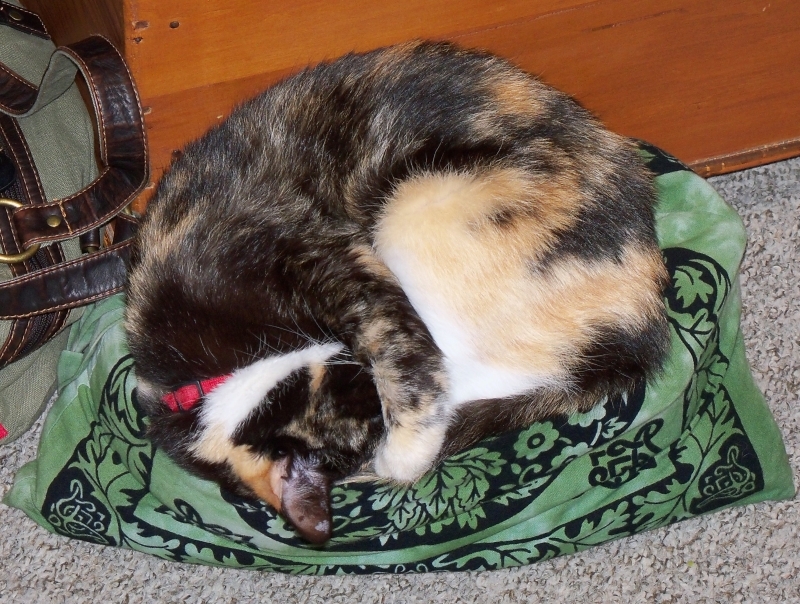 If you just can’t get into your knitting, curl up on it. 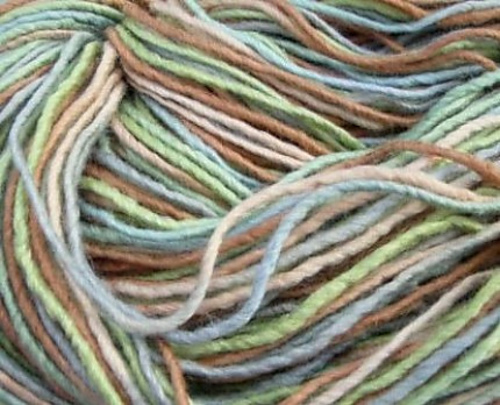 A good while ago I had MamaJude dye this Merino Silk yarn especially for me. I loved it so much that I couldn’t use it! I finally found a project for it. Paired with Araucania Ruca (100%Sugarcane) this is luxury itself. Using the Ruca on the 10 dent heddle, I warped the loom in groups of 8 strands with a small space separating each group to create a very subtle texture. It very soft and drapey. 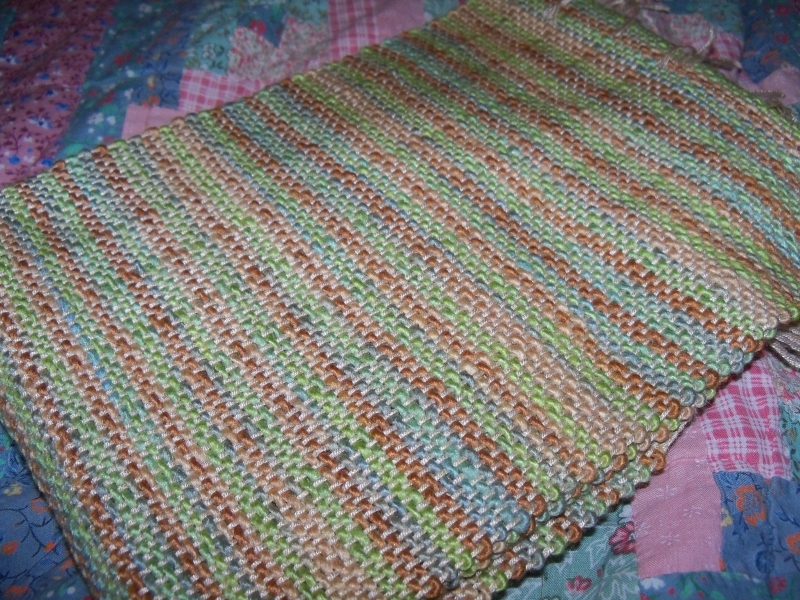 I managed to get a good long scarf out of the 2 skein with good sized thrums leftover of the Ruca for scrappy projects. Belly – Star – Also a favorite album although this was introduced to me much later in life by a guy who wanted me to sing with him in a talent show in high school. I would compare it to a pop rock alternative kind of version of Annie Haslam and PJ Harvey combined with the wild melodies spanning greatly in vocal range combined with somewhat disturbing lyrics that are made to sound joyful even. Well, I said I would try this last night and I did! Here is my completed Schnibble Snuggle. It was quite fun to make, although probably a bit too much work for a snuggle really. I think next time I do it will be for an actual quilt or a pillow. Really nice project for scraps! As I’ve entered back into the world of quilting at this technologically advanced time, I have found myself surfing the web looking for cool new ideas and patterns. One site I’ve stumbled upon is Instructables.com where tons of individuals have uploaded tutorials for all sorts of neat projects. 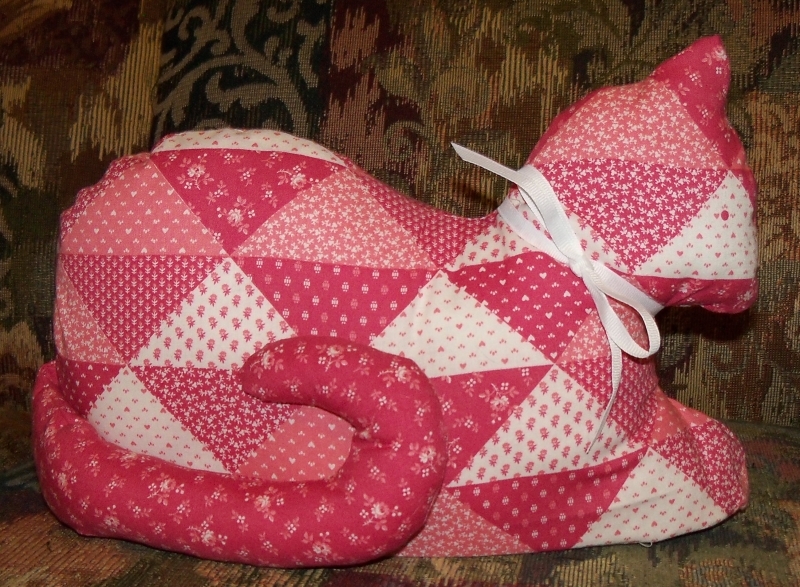 One such project I’m really eager to try is the Schnibble Quilt. In fact I may just try it tonight! In fact, I think it’d be a really neat way to make quilted snuggles for the kitties if you just made one block and bound the edges. Ta da! Sampler quilt COMPLETE! After a 9 year hiatus from quilting, I jumped back in to finish a nearly done full-sized quilt for my husband and I. Noticing all the mistakes in that quilt, I decided to practice my quilting skills before embarking on another full-sized project. I watched countless videos on YouTube (mostly Missouri Star Quilt Co. – they are awesome! ), poured over quilt books (from my own collection and the public library), and organized my stash of fabric (or at least the portion of it that’s in the house – did I mention I have had a fabric hoarding problem since I was a small child). Then I took a drawer full of scraps, my rotary cutter and what I’d learned and started piecing blocks. I just built the quilt as a went, going from the center out, with absolutely no plan at all. Your may be able to pick them out in the picture, but featured here are Crazy Quilt Blocks with a border, surrounded by Flying Geese units and Nine Patch squares, all of which are surrounded further by blocks made with Tube Quilting (a new favorite of mine). As you can see I decided to tie this quilt with embroidery floss instead of stitching. The backing is a 2 yard piece of flannel light pink background with cat faces. It worked out to be the perfect size for this “crib size” blanket (a handy thing to know if you are making a crib quilt). I created the binding by sewing together 6 strips from one of the new packs of fabric I got on my birthday shopping spree, and then pressing it all into a double fold binding tape just like you can get pre-made at the store. I had always gone with the store-bought stuff because I thought it would be far too tedious to iron them on my own. I’ll admit it – I was wrong. It was so easy and it made for a really unique binding that I LOVE! One very important skill that I relearned was to miter the corners neatly when sewing on the binding. As you can see from the picture, I am very proud of my neat corners! If you learned to quilt as a child and let those skills fall by the wayside, don’t be afraid to pick it back up again! You may just find that you really did enjoy it and using lots of cool new techniques you may be able to do more than you expected you could. I found that not limiting myself to a seriously planned out project really allowed me to move through this experience creatively and relaxed. Here’s another sewing project I completed this weekend. A country kitty door stop from preprinted fabric, complete with rocks inside to really hold a door. This is destined to be a Christmas gift.